These past six weeks or so, LD has been doing a lot of work in his math workbook (that’s not terribly exciting to blog about, is it?!!). That was easiest for me while we were on travel and as we settled in. We generally use Right Start Math, but it is quite Mom-intensive, so we had to put that on the back burner for a while. In fact, we only started back into Right Start this week. In addition to the math workbook, we’ve been playing some math games. 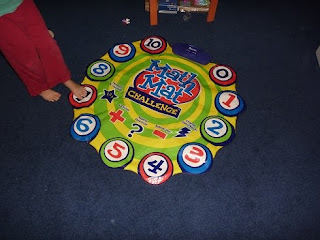 DD is LOVING math time and begs to play math games most of the day. 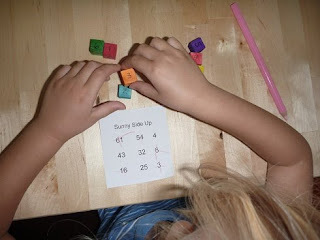 She is doing simple addition with these games while LD has been focusing on subtraction. Fast Track: We got the idea for this from the wonderful book, Games for Math by Peggy Kaye. It is a simple path with several start boxes, several win boxes and others such as draw two, go ahead two, go back three, stay put, double move, triple move. 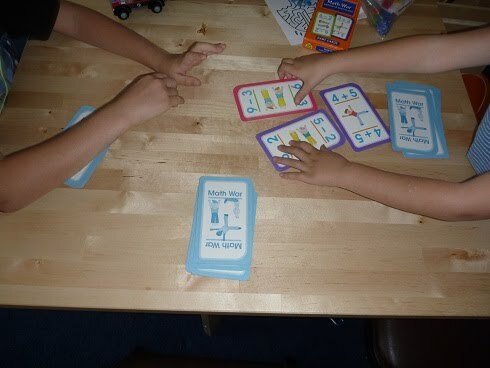 Using flash cards (for DD — addition facts to 6 such as 2+4 and for LD subtraction cards such as 13-7) a player moves until he/she cannot move anymore. For example, if you move from the start place and move 4 spots and land on a “double move, the player then picks up a new card and moves that number of spots twice. If they then land on a “move ahead 2,” they move ahead. They keep moving until they land on a spot such as lose a turn, start, or stay put. The object is to be the first person to land on one of the “win” spots. 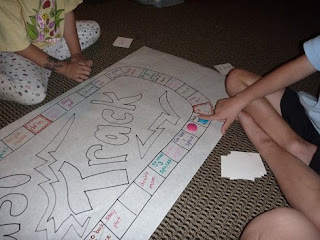 It’s a fast moving games and a lovely way to review math facts. All three kids have had fun with the Math Mat recently. ED (age 2 1/2) steps on the numbers as they are called out (with help from her brother and sister). DD does the numbers and occasionally does the easy addition and LD does addition and subtraction trying to get as many points as possible. 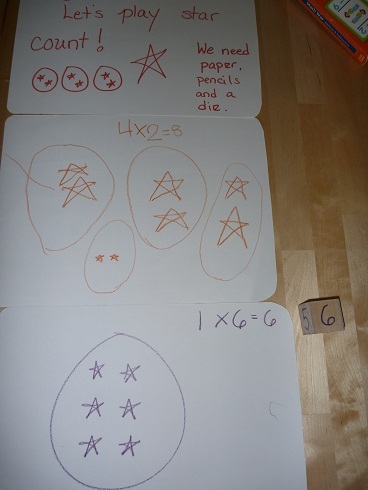 Another game from Peggy Kaye’s book, Games for Math, is called star count. LD and I have played this for the past couple of weeks. On your turn, you roll the die and make that number of circles on your paper. Then it’s the other player’s turn. On your second turn, you roll the die and draw that number of starts in each circle. The winner is the person who has the most stars. A quick, easy game and a good intro to multiplication. We’ve also been playing a lot of Math War these days (the person with the highest number wins that round). There are some wonderful addition and subtraction cards at Confessions of a Homeschooler (called Add It! and Subtract It!) if you want to print your own. DD still wants to play Sunny Side Up most every day! Here are the directions again. Again, this is a great game for introducing your preschooler/kindergartner to double digit numbers.